Here are five reasons I’m still happy I live in Penang. Back home when the car needed a service I always had to book in advance. Here in Penang I don’t have to think about booking ahead. I just call my mechanic the same morning that I think about a service, he comes out to my apartment on his motorbike, and takes my car back to his garage. When he’s finished he brings the car back and takes his bike home. Yes, you have to pay cash, but he always issues a receipt or a guarantee (depending on what he has repaired). Plus, no singular service in the six years that I have been using him has cost over $100. Recently, not being the mechanical type, I mistook the oil reservoir in the car for the radiator and filled the engine with water. After realizing my mistake, I called my mechanic right away, and an hour later he had arrived with a tow truck. He took my car away—free of charge—and two days later, after he had flushed the engine and had it working perfectly, he brought it back. This isn’t unusual in the service industry in Malaysia; in fact, that high level and efficiency of service would be par for the course for most industries here. Malaysians don’t always use full sentences when speaking in English, but one of the words they use more than any other is “Can.” That one word conveys the concept that nothing is impossible. You will hear it from mechanics, air-conditioning technicians, stall holders, and even people on the street when you ask them a question. “Can” says that there is a will and a way to get anything and everything done, without going into the details of how. “Can” is used in conjunction with the easy-going, can-do-anything attitude that I love. It’s the instant response to any situation, no matter how large or small; accompanied by a smile full of confidence. Penang is known throughout Asia for its food. In fact, it was voted the best place in the world by Editor-in-chief of Rodale’s Organic Life, James Oseland, for its food. I love the fact that there are certain street stalls that don’t open until midnight, where you can have a meal for just $3, and most of it is to die for! Malaysia’s infrastructure is second to none, and its road system is the best that I have experienced in Southeast Asia. 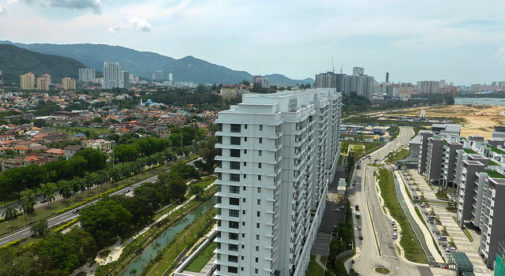 From Penang I can be in the country’s cool shopping capital, Kuala Lumpur, in less than four hours by car. Another two hours south of Kuala Lumpur and I could be in Singapore. Heading north, if I left Penang at 6 a.m. on any given day, in just two hours I could be having breakfast in Thailand. I also love Penang’s beaches, and there are some really decent ones on the west side of the island, where you can read a book under a swaying palm and just relax for the day. On any given weekend they will take me 40 minutes to reach, whereas during the week I’ll be there in 20 minutes. Malaysians in general are accommodating and friendly, and the majority of them speak English. That alone makes living in Malaysia so much easier. Knowing that you can move to a country where you don’t have to worry about speaking the language just takes the pressure off. From renting an apartment to finding a shopping mall, when everyone speaks English it makes a difference. The fact that you still don’t have to book an appointment to see a specialist here just knocks my socks off. You don’t need a reference from a MD either. No matter who the specialist, it’s as easy as going to the hospital of your choice, registering (you only have to do that the first time that you go) and then waiting outside his or her office to be seen.